Incredible new product, and looks like a real game changer. Bottom line, I'm super excited for Adam's. Can't wait till it's released! Interesting - I'm going to put Ceramic Wax on the daughters Mustang and I wonder how this would go with the wax or is it a "instead of" product. I'm sure we'll get more info as it gets closer to release. I just hope it doesn't become another question on whether it goes Under or Over like we have with BG. Either way, I have enough Red vehicles at my disposal and no fear of experimenting. Interesting. I’m curious to learn the intended use. Example...look how tiny a bottle of coating is and look how far that gets you! Is this more of a maintenance product, kinda like Boost? That’s a big bottle of stuff if not. Theres also a small, very small part of me sitting here thinking “oh great, another damn product to try to fit into my lifestyle”. I already have ceramic wax that I can’t use fast enough. First world problems, right?!?! This sounds similar to Can Coat by Gyeon. It fills a need for a client who wants more than wax, but less than a coating. Although with different sealants and waxes our there it’s hard to say just where it fits. See above about Gyeon Can Coat. It’s most likely a stand-alone or last step. True ceramic coatings and a product like this are vastly different in terms of application. The chemicals (vehicle) to deliver a spray will naturally require more product. For example when we airbrush wheels, we use way more product than simple hand application. That will account for the volume of the bottle on some level. You also have to plan for the excess that ends up in your towel. Sprays leave much more surplus chemical than a wipe on product. And another thought, just because a product is released doesn’t mean it fits into your lifestyle. It’s okay to not use everything. We don’t use everything from everyone. In fact, there isn’t a manufacturer we use everything from. Sometimes it’s okay to say no. It just doesn’t fit for me. It’s not a reflection on a product, but your process and how things fit in. There’s a million ways to do the same thing in detailing. Our process works for us. It may not work for everyone. It doesn’t make one better than the other. Yep, Cancoat comes to mind for sure. The term 9h is a marketing/hype word that is practically meaningless in real world car detailing applications. A coating’s effectiveness is measured by its ability to self clean, protect against contamination, and its aesthetic properties. No coating is actually providing any resistance to scratching based on its hardness. Helping to reduce swirl marks is a function of the self cleaning properties and preventing contamination from sticking therefore making the wash process safer/easier. Exactly this. We actually offer a 10H coating, but I never use it as a sales pitch for it. I use the longer durability, deeper gloss and more layers as the pitch. Hardness is just a number people can cling to it seems. If that's the case it makes sense to me that CB is still required. Not that I'm complaining, just thinking out loud. It's my understanding this is a coating, simply in spray form. And from what I also understand, 9H is the highest you can go...10H is not physically possible. 9H describes the hardness of the material, but the thickness is what also matters for durability. Similar to all of Adam's coatings are 9H, but the wheel coating is the thickest and thus most durable. This probably won't last as long as the nomal paint coating, but it is a coating no less, that will give likley months of protection to those that want this as an option. Will be interesting to read more details on this when it's released. Yes, I'd say that's mostly accurate, but it's still a coating so some clarification should be given. It's my understanding this is a true 9H coating, simply in spray form. 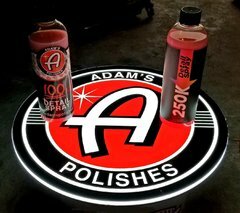 It's an original formula developed by Adam's, so no true comps on the market right now. And from what I also understand, 9H is the highest you can go...10H is not physically possible. 9H describes the hardness of the material, but the thickness is what also matters for durability. Similar to all of Adam's coatings are 9H, but the wheel coating is the thickest and thus most durable. This won't last as long as the nomal paint coating, but it is a 9H coating no less, that will give months of protection to those that want this as an option. Will be interesting to read more details on this when it's released, but I can tell you from personal experience, my first impression was it's going to be a game changer. I’m curious how it works and how long the open time is when spraying it. Part of the slow tedious nature of coatings is working small to eliminate high spots. Hopefully it is a new segment. I’ll be watching to see more about this product (and it’s competitors which will naturally come out). I’m familiar with the hardness scale, it’s just an advertising gimmick as it relates to auto detailing. It’s not something tangible and only something to be talked about without being proven. The Tire Armor is easy, but recommend layering. I’m very skeptical on a sprayable coating. Everyone uses the “coating” label like Hydrosilex, Shine Armor, etc. when they are silica based sealants. This picture of the paint shows it’s an actual coating of sorts, but how this levels and how long it has to sit is the thing that makes me wonder. Then there’s the longevity and self cleaning aspect as mentioned by the people above. It’s just it’s interesting timing with all “coating” hype going on currently. I am happy if they are pushing to the next level with advancements in science. Better than T-shirt’s and air fresheners. Here it is from Kyle! It kind of seems like Clutch to me even though Kyle is denying it. Sounds interesting either way. I've never used Clutch, but just reading the manufacturer's website it sounds more like Ceramic Boost to me. Agreed with Marty. This spray will have a much higher SiO2 percentage since it's a true ceramic coating spray, not just a boost. There is no equivalent on the market right now. 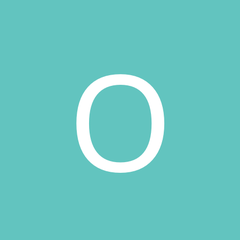 I have a Ceramic Spray that claims 20% SIO2. Wonder how much this will have? Since the Ceramic Paste Wax has 33%, I'd guess even higher. It's a ceramic coating. Sounds similar to Mckees paint coating or can coat. Looking forward to it though! Just an FYI there is tangiblity to the 9H rating though its not apples to apples bc there is no standard to the weight you must put on the pencil to claim 9H. So different companies will scew their test to claim 9H. What it becomes is inapplicable. Will it protect against scratches better than a 7H? Most likely but not absolutely. Better than 5H? I would say almost 100% but I’m not a test expert by any means and don’t know how much you can scew the results. In any case the scratches you will prevent are basically equivalent across the board. It will protect from wash swirls and similar types and nothing more. Agreed with Marty. This spray will have a much higher SiO2 percentage (it burned my nose!) since it's a true ceramic coating spray, not just a boost. There is no equivalent on the market right now. I can think of a few off the top of my head. 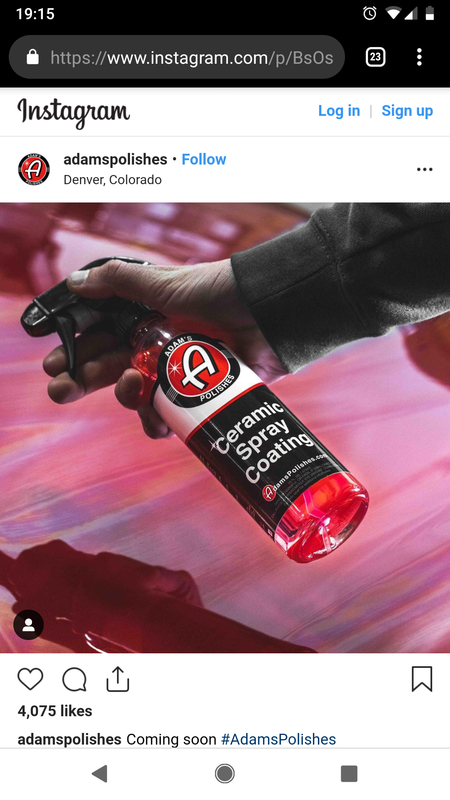 Even Mother's is getting into the spray coating game with CMX Ceramic Spray Coating, which is fixing to hit the shelves.